The capital of Alytus County, Alytus is the sixth largest city of Lithuania. Alytus lies on the banks of the Nemunas River. Nestled between the beautiful green forests and fields, Alytus is the historical hub of the Dzūkija region and is popularly known as the capital of Dzūkija ethnographic region. This city is divided into two parts which is separated by the largest Lithuanian river Nemunas. The smaller part of the city is located on the right shore of the city and the bigger part of the city is located on the right shore of the river. Alytus is a city with serene beauty and vitality. The best way travelers can explore all its attractive destinations is by renting a car with Lithuania Cars Rental. Alytus is full of fascinating attractions and places which are worth visiting. For the art lovers this city boasts many fascinating museums like Fight for Freedom Museum, the Alytus Museum of Regional Studies, Alytus Law and Order Museum and many more beautiful galleries. The travelers on a family vacation can spend pleasurable time at the beautiful theme parks like the City Garden, the Youth Park, the Resort Park, the beautiful Gulbyne (Swan) park and sculpture park Drevinukas. 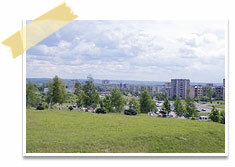 The visitors can also find many fascinating nature reserves and protected areas in this city. The visitors interested in history and architecture can find alluring churches, monuments and beautiful many historical places to visit. Alytus offers an amazing range of leisure activities like horse riding, skiing, review flights, tennis courts, a paintball, canoeing and many other fun activities. The night clubbers can enjoy thrilling nightlife of the city and the shopalholics can spend great time at the amazing shopping centers. Book a car hire with Lithuania Cars Rental and enjoy the best car hire deal with additional benefits like CDW, insurance, road side assistance and 24/7 customer support. With an extensive range of rental locations, Lithuania Cars Rental ensures a comfortable and stress free commuting in Lithuania.